I’ve had a feeling for about a month, but I didn’t want to verify it until I was past any “usual” miscarriage. So I stalled, said I’d test on Christmas Eve if I hadn’t I’ve had a feeling but physically my body hasn’t given me any clues. I haven’t missed a month, but something is different. After trying so hard to get pregnant I was afraid to even hope. So, I put it out of my head and stayed busy with work. I promised myself if I still felt that way Christmas Eve, I’d do a home pregnancy test. IT WAS POSITIVE! Jeff and I could hardly believe our eyes. So I took another test that evening, and another Christmas morning. They were all positive. What a Christmas present! I called in sick at work today and went to see my “unfertility specialist”. The blood test confirmed it, I was 2 ½ months pregnant. Jeff and I are going to have a baby! The Dr. called it a spontaneous conception!??? My first ultrasound! I could make out the head, 2 arms, 2 legs, and a wildly beating heart. All of this from something only about an inch long! Dr. Massey released me to my regular OB/Gyn and gave me my first baby gift, a feeding spoon. 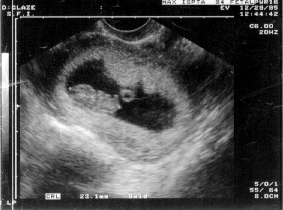 Its totally awesome…there is a tiny person inside of me. Friends at work want to see the sonogram. Wait til my boss gets back from vacation. Two employees pregnant in two months! Began my prenatal checkups today with Dr. Allen! Tomorrow I have to go back for a blood test because of Jeff’s Hepatitis antibodies and my RH factor. Dr. Allen says everything looks good and I’m almost into my second trimester. My boss was terrific when I told him that I was pregnant! He said he would hold my position open for me when the time came to stop working. That is…if I decide to go back to work. I really want to stay home and be a full time Mommy. I’m beginning to show. A lot of my clothes are too tight to wear, I’m wearing my baggy pants and over sized tops know. They don’t meet the dress code at work, but my boss says not to sweat it. I’m thinking a lot about the nursery (formerly my craft room) I’ve decided not to have an amniocentesis. We’ll love whatever God gives us. There is so much to buy! A Crib, stroller, highchair, car seat, baby linens, baby clothes, etc….. The ultrasound shows that the baby (I’ve nicknamed “little squirt”) is growing like a weed. Jeff went with me so he could see the baby moving and watch the heartbeat. Every time I’ve had an ultrasound, little squirt has been sucking his\her thumb. I wonder if this baby will ever realize how much we have hoped, dreamed, and prayed for this miracle. I never wrote down the due date. It started out Aug. 12, but now it has been officially changed to August 6. That seems so far away, and yet, it seems so close. I felt the baby move for the very first time when we were in a restaurant after church while we were in Guntersville, AL visiting Mom and Dad. Today after work I went shopping for “fat” clothes (maternity clothes) Jeff and I have bought the nursery furniture. A crib-bed combo, a changer-dresser combo and it has a night table we can get later. I’m dying to know if it’s a boy or girl, but the baby just won’t let them see on the ultrasounds. Of course, my Dad has declared that it’s a girl. I asked him why…..he said I just know. Mom went with me for this ultrasound. I think she was amazed that she was actually looking at the grandchild that she had prayed for for so long. Afterwards we went to Babys-Are-Us and she bought a 5 piece Precious Moments crib set that I had picked out. I got a maternity tee shirt that says “I’m due in August”. I just got home from my twice a week prenatal aerobics class. I enjoy the class. We all sit around before class and moan and complain about our new and enlarged pregnant bodies, but none of us would change it for the world. Last Monday a car rear ended us. There was no damage to either car, but even so, I went straight to the Doctors and had Little Squirt checked out. Baby is fine…thank God. Jeff and I celebrated our anniversary by going shopping at Baby Superstore and eating at Olive Garden. That’s one perk about being pregnant….I can eat all I want. But I’m not eating that much and I’m big as a house. I don’t know how I can keep growing for 3 ½ more months. Little squirt is sure dancing around a lot lately. I don’t think she ever stays still. My rib cage is 6” bigger…….34” to 40”! Wow! My third trimester! It seems like it can’t be that long ago that I had a waistline and wasn’t wearing 42D bras. Jeff is going to California for a week tomorrow, so this will probably be the last time for a very long time that I’ll have the house to myself. Today we started inventory at work…..but Dennis (my boss) said “I’m not pushing you, not in your condition”. I worked 8 AM to 12:45, came home to rest, and worked 8PM to midnight. Then I’ll work th same hours Monday. This paycheck will buy the bassinet, liner, pad, and extra sheets that I’ve wanted. The little squirt is upside down (breech) but there’s plenty of time for her to turn herself. Today Judie told me she wanted to buy me the bassinet as our baby gift! My inventory check will be a good start on baby’s savings account. I’ve overloaded my left hip and knee. It looks like I’ll have to quit working soon. I am so huge now, I can’t imagine what I’ll be like in 2 ½ months. They say the baby weighs 3 lbs. Now so she\he is going to be a big one. The doctor says no more travel for me until the baby comes. We had been planning to go over to Mom and Dad’s one last time, but, we can’t. I’ll also miss Graham’s graduation, but I really didn’t want to go to that. Last day of work! I’ve been ordered to stay off my feet for the duration. My first of 4 baby showers is this weekend. The baby doesn’t just move now, he/she creates tidal waves. You can watch her turn over and stick her bottom up with her leg sticking out just by watching my tummy. It’s cute……..kind of. This baby is going to be a dancer. She doesn’t know how to stay still. He\she is be-bopping all day every day. Grandfather Glaze had a massive stroke last night and it doesn’t look like he’ll make it. This would be his 22 Great Grandchild. Jeff and I began childbirth classes last Monday. Marianne and Judie gave me a very nice shower. Linda and Karen also gave me a nice shower. The explorer troop is giving us one. I just keep getting bigger and bigger! Yesterday Jeff and I “graduated” from our prenatal class. We’re now certified to have a baby?! Today had a prenatal check up. I’m 70% effaced and the baby’s head is a station –1. Labor can’t be a full month away. I had a stress and non stress test and the doctor wasn’t happy with the results so he sent me to the hospital for an ultrasound. Everything is fine and the baby is defiantly a girl! It also confirmed that the baby is already 7 ½ lbs. They are still sticking to an August 6 due date but I’ll bet anything that Julie comes before July is gone. My water broke at 7 pm last night and they admitted me to the hospital. They induced labor…..after 12 hrs. of hard labor and 2 hrs. of pushing my brains out, they called a halt and did a C-section. If I hadn’t been so tired and so thrilled to see my baby, I would have told them off. Oh well, alls well that ends well! 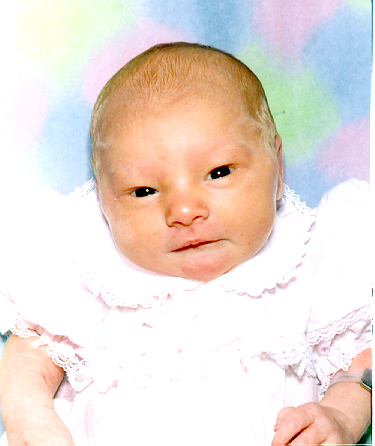 HAPPY BIRTHDAY JULIA ANNETTE GLAZE! Please let us know of updates, corrections, and potential improvements to our web site.